Yummy Lips Gourmet Lollipops are crafted with passion and experience, making them the best tasting gourmet lollipops in the world. 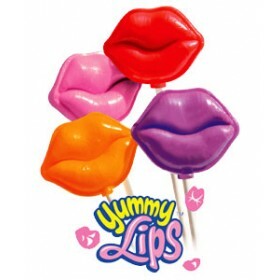 Yummy Lips are available in these mouth watering flavors: Bubble Gum, Cinnamon, Grape, Raspberry, Strawberry, Watermelon, Orange, Berry, and Cherry. Top Selling $.50 fund raiser. High Profits ˆ Earn up to 65% profit! FREE SHIPPING - The Mega Event (R) pays for ALL shipping & handling on direct sale products!